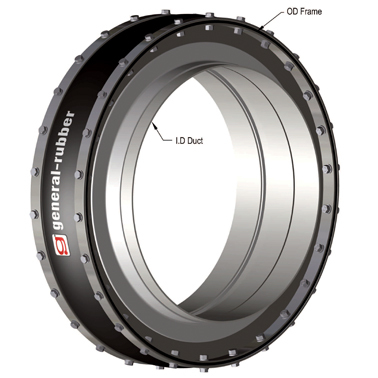 General Rubber's Style 1096 PTFE composite ducting expansion joint is designed for flue gas continuous service up to 1200°F. This construction is optimally designed with a PTFE fluoropolymer composite flexible element, cavity pillows, steel frames and flow liners as the support structures and applications require. Composite layering includes a heat and abrasion resistant high tensile fiberglass reinforcement (gas side), insulation matting, 9 Mil thick PTFE corrosion barrier (dew point sensitive), insulation matting, high tensile fiberglass reinforcement and an outer layer of PTFE fluoropolymer coated high tensile fiberglass. Additionally, they are designed to absorb large all-directional movements, reduce noise and vibration, compensate for misalignments, provide access to ducting and equipment and relieve duct and anchor stresses.